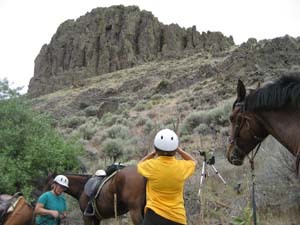 I've been wanting to ride with Karen, an endurance rider and biologist for the USGS, for a couple of years now. I love birds of prey, but know so little about them, and Karen's specialty is raptors. 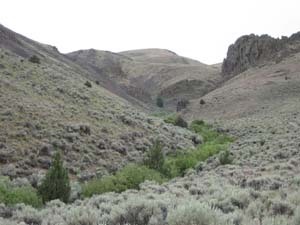 And this area in Owyhee county is one of the best in North America for viewing raptors, with the Snake River Birds of Prey Conservation area, home to the one of the world's densest concentrations of nesting birds of prey in North America, being on our back doorstep. Sixteen raptor species nest here and eight raptor species either winter or use the area during migration. I finally got my chance. Carol and I hauled to Karen's house near Murphy, and joined her for a work mission of checking on golden eagle nests in a nearby canyon. Going out with Karen is like being with a Guru of the bird world, I hung on her every bird word. 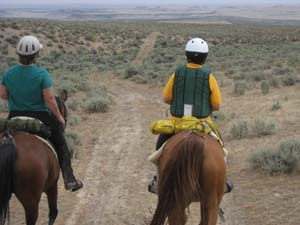 And we got to do the trip on horseback, an added bonus! I rode ever-placid Jose, who really doesn't mind where he goes or what he's asked to do. We started out along BLM roads heading for Moore Creek, toward the mountains. 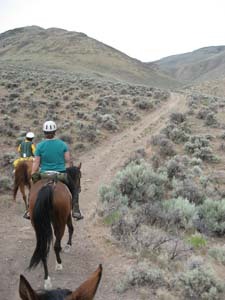 As we slowly gained altitude, Karen pointed out where wild horses normally graze in one of the little drainages. We didn't see any, but did begin to see scattered wild horse droppings, though they were old ones. Lower down, the creek was dry, but as we got a little further on, a little water was flowing in the creek, and the wildflowers and grass took advantage. Jose kept looking to our left, the east, as we followed Karen and Carol along the trail; he knew exactly where home was, though he'd never been here before, and by my figuring, on the 20 or so mile drive to Karen's, the trailer changed directions approximately 5 times, and did a turn-around at Karen's house. I once let him do what he wanted, to see what he'd do. He looked left and took a step left, and since I didn't correct him, he turned 90* to the left – straight towards home, maybe 15 miles as the raven flies. He didn't care that his companions were continuing up the trail; he kept walking east. I'd bet if I had unsaddled him and let him go, he'd find his way home in a day or two (allowing that he could get over fences). 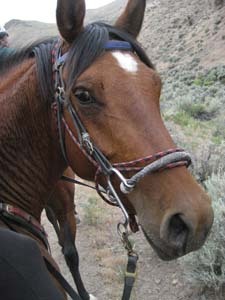 But instead, he let me guide him back onto the trail, and he continued along after the other, with no objection. He was fascinated by the piles of wild horse poop along the trail, and when we come to one section that had multiple piles, some big ones left by stallions, and individual piles left by the rest of the herd, Jose wanted to stop and sniff all of them. We humans finally spot a horse herd halfway up a mountain to our west, and eventually they saw us, but we were far enough away that they were unbothered – no way would we have been able to get to them easily. Our horses didn't notice them visually, though they were certainly aware there were some different kinds of horses out there somewhere, not just domesticated horses like they were. 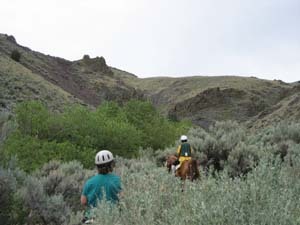 The trail was a bit overgrown as we went further into the canyon – this is the first year in a while that cattle aren't being run on this creek. It's being given a much-needed break, and the grass is coming back nicely, even though there hasn't been much rain in the area this year. 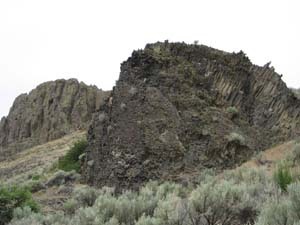 There's some old-growth sagebrush that's taller than a human on a horse, and some willows were so low I had to throw myself flat onto Jose's back to get underneath – and it still almost scraped me off his back. 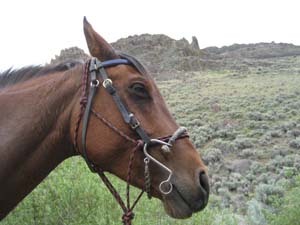 We got to the cliff we were seeking after about 4 miles, and we got off the horses and unloaded the spotting scope and tripod that their horses had carried tied onto the back of their saddles. While Karen set up, I held Jose and Carol held the other two horses. The other horses chowed down, while Jose stood there, either being tired, or not quite completely at ease, maybe because of the sense of the other horses around. I think he really was a bit tired, as he'd had some good rides a few days in a row. Of course, that didn't stop him from trying to eat every clump of grass on the way up and then again on the way down. We spotted 4 golden eagle stick nests on this cliff in front of and above us – some pairs can have dozens of nests in their territory that they alternate between - but no sign of the birds. This is about the time the young fledge (leave the nest). One nest looked as if it had possibly been occupied this spring, and it was possible there were babies still on the nest (and the adults watching us from somewhere) – we just couldn't see in the nest. The young will fledge at roughly 2 ½ months old, but still depend upon their parents for another 3 months before moving out of their parents' territory. Golden eagles are birds of open country, from high desert to desert grasslands to above timberline. Normally they aren't found in forests. They had a good view from their cliff perches across the fairly narrow canyon, but it was just a short flight down-canyon to hundreds of miles of open desert grassland, and just a hop up over the cliff to the open hills leading to the mountains. Some birds migrate annually, but golden eagles only migrate when there's a lack of abundant prey. There were plenty of pigeons on the cliff, but golden eagles tend to avoid them, instead preferring rabbits and hares as their primary food. (And there's plenty of them out here.) We stayed a while longer watching the nests, but finding nothing, packed up the equipment and headed home. That's the way many bird surveys end up... inconclusive. But it was a nice ride on a very lovely day (the clouds kept the intense heat away), with good company. Next week I get to accompany Karen to check on more golden eagle nests!